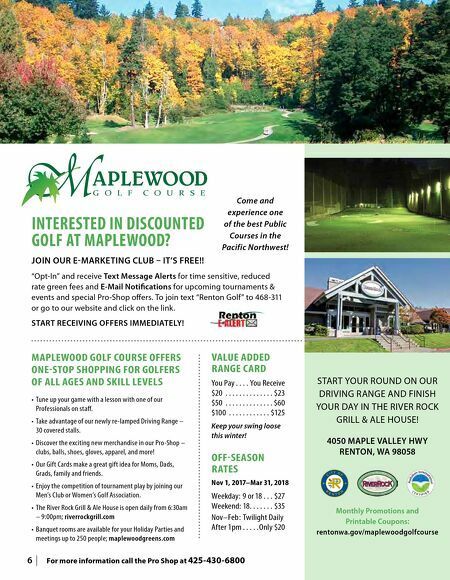 6 | For more information call the Pro Shop at 425-430-6800 Monthly Promotions and Printable Coupons: rentonwa.gov/maplewoodgolfcourse START YOUR ROUND ON OUR DRIVING RANGE AND FINISH YOUR DAY IN THE RIVER ROCK GRILL & ALE HOUSE! 4050 MAPLE VALLEY HWY RENTON, WA 98058 Come and experience one of the best Public Courses in the Pacific Northwest! VALUE ADDED RANGE CARD You Pay . . . . You Receive $20 . . . . . . . . . . . . . . $23 $50 . . . . . . . . . . . . . . $60 $100 . . . . . . . . . . . . $125 Keep your swing loose this winter! OFF-SEASON RATES Nov 1, 2017–Mar 31, 2018 Weekday: 9 or 18 . . . $27 Weekend: 18. . . . . . . $35 Nov–Feb : Twilight Daily After 1pm . . . . . Only $20 • Tune up your game with a lesson with one of our Professionals on staff. • Take advantage of our newly re-lamped Driving Range – 30 covered stalls. • Discover the exciting new merchandise in our Pro-Shop – clubs, balls, shoes, gloves, apparel, and more! • Our Gift Cards make a great gift idea for Moms, Dads, Grads, family and friends. • Enjoy the competition of tournament play by joining our Men's Club or Women's Golf Association. • The River Rock Grill & Ale House is open daily from 6:30am – 9:00pm; riverrockgrill.com • Banquet rooms are available for your Holiday Parties and meetings up to 250 people; maplewoodgreens.com MAPLEWOOD GOLF COURSE OFFERS ONE-STOP SHOPPING FOR GOLFERS OF ALL AGES AND SKILL LEVELS INTERESTED IN DISCOUNTED GOLF AT MAPLEWOOD? JOIN OUR E-MARKETING CLUB – IT'S FREE!! "Opt-In" and receive Text Message Alerts for time sensitive, reduced rate green fees and E-Mail Notifications for upcoming tournaments & events and special Pro-Shop offers. 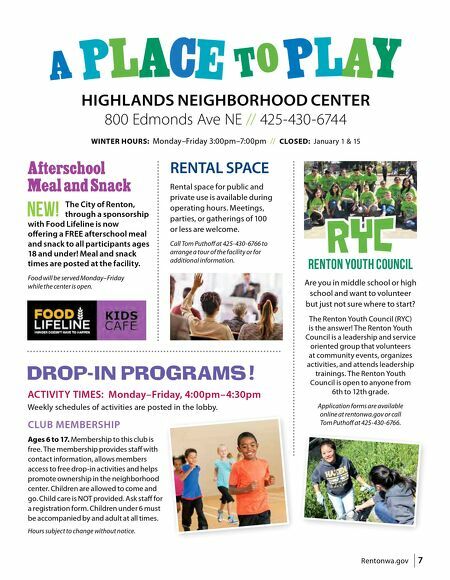 To join text "Renton Golf" to 468-311 or go to our website and click on the link. START RECEIVING OFFERS IMMEDIATELY!